*Home sweet home. Wait, what happened here? Daggers and wing boots, mantras and monsters await you. This is the tagline for Faxanadu and though there is only one dagger, wing boots, oddly enough, are in fashion among the elves. There are more mantras and monsters than you can wave that dagger at. 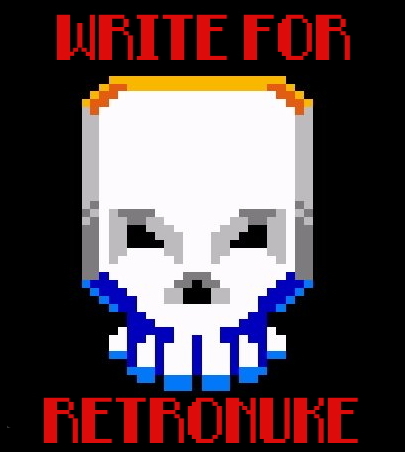 While this game is widely unknown, it has a cult following and for good reason. It is an overall excellent game that shows traits that have become an industry standard. Released in 1988 by Hudson Soft, Faxanadu is one of many side scrolling adventures on the NES that, even though most reviews give it acclaim, fell into the abyss of the unknown at time of launch. The likely cause for this is the fact that Faxanadu is actually a spinoff title from Japanese series titled Dragon Slayer, and one of only a few of the earlier titles to be localized outside of Japan. The story of Faxanadu unfolds as you play through the game. The elves live in the World Tree, a tree the size of a country complete with several cities and just as many dungeons. The dwarves live in a vast underground society and things are relatively peaceful between the two nations. One day the World Tree was hit by a meteor and it started dissolving into the waters, turning it to poison. This poison corrupted the dwarves and they started to mutate and attack the World Tree. The game picks up with the player character, an elven adventurer, returning home from a long journey to find his home town in ruin and mostly deserted. The king tells you of the plight of your homeland, gives you a stipend and sends you off to save the World Tree. The rest is up to you to explore and find out how to stop the dwarfs. 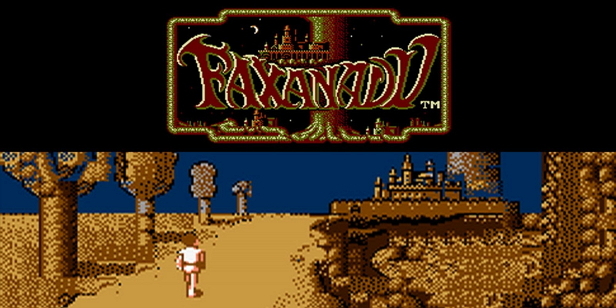 Faxanadu is a side scrolling ARPG that has become popularized as ‘metroidvania’. You slay enemies to gain experience and gold and, sometimes, bread that heals you. As you venture further through the tree you will come upon towns that have the standard vistas: item/weapon shops, healers, a key shop, bar, houses, and a temple which houses a guru who levels you up and saves your game. Leveling up in this game differs to the standard level systems you may be used to. Each new level nets you a fancy new title and with it, a new gold stipend when you respawn. This makes it easier for you to restock and get back to adventuring instead of farming gold (though you will probably farm a bit for new gear). *Cool guy Joe’s got what you need. Gold is used to purchase things like new weapons and armors to make your character stronger. Gold is also used for purchasing keys, keys, keys. Most dungeons in the game, as well as doors separating world zones, require keys. You purchase these keys from none other than the smoking cool guy key vendor found in every town. There are several types of keys and you need the right key for the right door. Keys are a one-time use and the door will lock behind you, so if you leave the dungeon you will need to spend another key to reenter. While this can be frustrating, dying in the same dungeon or accidentally leaving as soon as you enter burns keys, it isn’t too big a detractor from the game. The controls are tight and responsive, though some of the platforming jumps are stretched to the pixel. The game has a dedicated jump, which I, personally, am a fan of in platformers like this one. There is no crouch, which only seems a problem in the early stage of the game as the dagger can’t hit the smaller enemies forcing you to rely on magic. *And the lord said unto him “tJSsIvutCISMFqdMIQ” …wut? The game has several diverse locations, all of which have their own atmosphere and vibe. The first couple of zones are full of greens and browns contrasted with the blue sky behind as you explore the roots of the tree. Next you enter into the tree itself, known as the World of Mist. The mist is actually smoke from where the meteor caught it on fire. Once you climb through the smoldering trunk of the tree, you will find yourself traversing through the branches themselves, this tree is enormous. After clearing your way through the branches you reenter the tree in what looks like an almost alien landscape. While I wouldn’t put the OST in a top ten this game does have some excellent music, from the blast of enthusiasm as soon as the cart boots up to the shopping jingle that you will inevitably hum along to. Each zone mentioned has its own theme that helps set the tone of the area, from the harrowing jumps through the branches to the haunting stroll through the World of Mist this game has a sound for you. For as much praise as I give this game, it is not without its flaws. I already touched on the keys being a nuisance, but there is a glaring design choice that will frustrate and that is enemy placement. Enemies already respawn every time you reenter a room. Now add to that the fact that there are several rooms that have enemies placed at entry ways, usually ladders you can’t attack from, and you have several forced hits. Sometimes these will knock you back into the previous room forcing you to try to not get hit again. This is the biggest detractor of the game but should not deter you from playing it. I strongly recommend that everyone play through this game at least once. In my honest opinion this game, along with a few others, shapes what is the quintessential formula for a perfect side scrolling ARPG. From the excellent story, setting, gameplay, and music comes an experience you won’t soon forget. A few parting words said best by the Gurus of the World Tree, “Don’t have negative thoughts. Just remember your mantra.” Good luck on your adventure, may you get a pair of wing boots of your own! *Glad that’s over, I’m outta here. Bradford Wright has been a fan of retro gaming since it was just called gaming. Born and (mostly) raised in Alaska, the long winter months were perfect for warm, cozy NES-side chats. He prefers the comfort and convince of console gaming over PC. When he isn’t playing games or writing, you can usually find him in the mountains hiking, biking, or snowboarding.